‘A Saturn year is 30 years, I’ve worked on Cassini for 29’, claims Doctor Linda Spilker, one of the main astronomers in charge of the Cassini project, the probe sent to Saturn to penetrate and study closely the nature of that planet. The synchronicity of this exploration is astonishing; anybody attracted to astrology and with a minimum of knowledge about this traditional science, knows that yes, the cycles of Saturn last 29 years and a half, and yes again, a scheme involving studying Saturn itself must take the same stretch of time. So, we should not be surprised by the astronomer’s astonishment about the 30 years spent in her project. But no matter how much accustomed we are of the synchronicity of life on Earth and the cycles of the planets, we are still amazed by their accuracy. Astrology and the world of symbols are an inexhaustible source of wonder. As normal modern astronomers, Doctor Spilker and her team surely belong to the sceptic type of hard lined scientists who refuse to believe in any kind esoteric thinking; the breach between astronomy and astrology became insurmountable between the XVI and XVII centuries in Europe, just about the time Giovanni Cassini (Jun/8, 1625) lived. The probe sent to Saturn was named after this Gemini scientist who was both an astronomer and an astrologer. Anyway, I have always claimed that astrology is not a belief, but a kind of knowledge; either you know the system of astrology or you do not know it. Unfortunately, I could not find any data about Dr Spilker birth date or any of her colleagues involved in the project; maybe it the future, if she is awarded the Nobel Prize, Dr Spilker biography will be around in the net, and we will be able to study Saturn in her natal chart. Inasmuch as a prominent Saturn (concentration, focus, endurance, strictness) in a natal chart might prompt a scientific career or a very serious approach to life, all the members of the Cassini project must have a strong Saturn in their charts. 3) The Grand Finale, when Cassini was commanded to destroy itself crashing against Saturn’s surface. Neither is there any date for the beginning of the project, if we take Dr Spilker 29 years working in Cassini plan, we can see that in 1988, Saturn was in Sagittarius, the same sign it is now; so the Cassini spacecraft completed its mission with its Saturn’s return, as many human beings do with their own missions. Since the Cassini, the spacecraft, is the hero of this astronomic adventure, the Sun (hero) in the charts represents the Cassini; the Moon (nature, mental activity, cultural systems, emotional and economic involvement) represents humanity because it was the Homo Sapiens Sapiens who made this big step. And if we are talking about a mission, a long distance travel, and an opening of a new horizon or dimension, Jupiter is the symbol standing for all this; then, of course, Saturn is the theme, the target, the length of time of the project, and the success or failure of it; Saturn becomes the main character in this epic. The Sun is conjunct Mercury in Libra in the Launching event chart; Mercury stands for the intelligence and resourceful minds of the organizers; both Sun and Mercury in Libra show the different alliances and deals between the NASA and some other countries, including Japan. The second House tells us it was a solid but expensive enterprise. 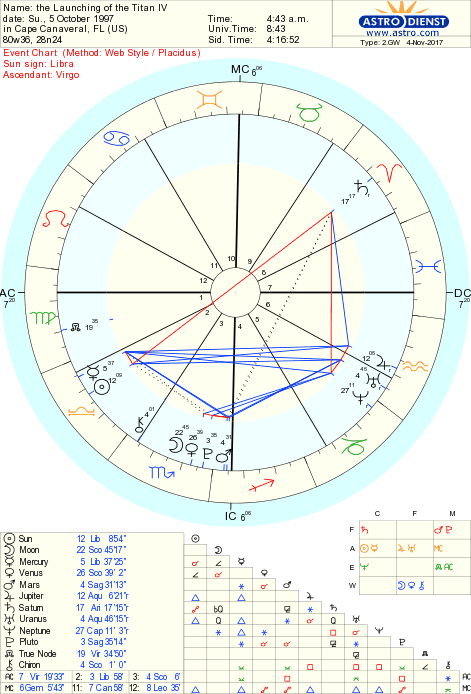 Most important, Saturn is in opposition to this Sun Mercury conjunction (how could it not be? ); we can think of delays and some oppositions among the directors or the politicians (Saturn stands for authority), but most of all, this opposition represents the strict concentration required for such a long time project, 30 years is a whole life. Libra is the sign of exaltation (the most demanding) for Saturn. The position of Saturn in the VIII House brings about the Plutonian (Pluto rules this house of death and life) dimension of the Cassini Mission; several dimensions and seals have been opened and broken, secrets we cannot understand yet have been disclosed. There was certainly a lot of fear and anxiety in the launching of the Titan IV, the Cassini-Huygens, charged with 33 kg of Plutonium 238 as a fuel; had the probe collided with the Earth, the whole humanity would have been exposed to cancer and other plutonian troubles. 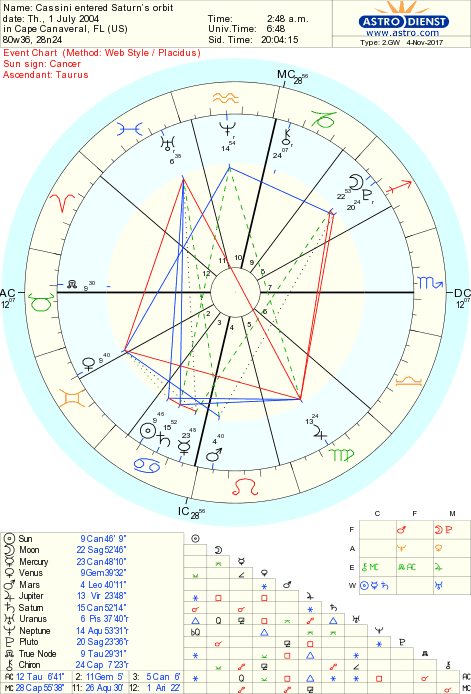 We can see the strong emphasis of Pluto in the Launching chart, the Moon (humanity) is in Scorpio (sign ruled by Pluto and by Mars), but Pluto conjunct Mars in Sagittarius (sing of optimism and hope) let expect a happy ending. Jupiter himself is conjunct Uranus in Aquarius; we have to see this as the opening gate of the Age of Aquarius. Saturn is always the door. 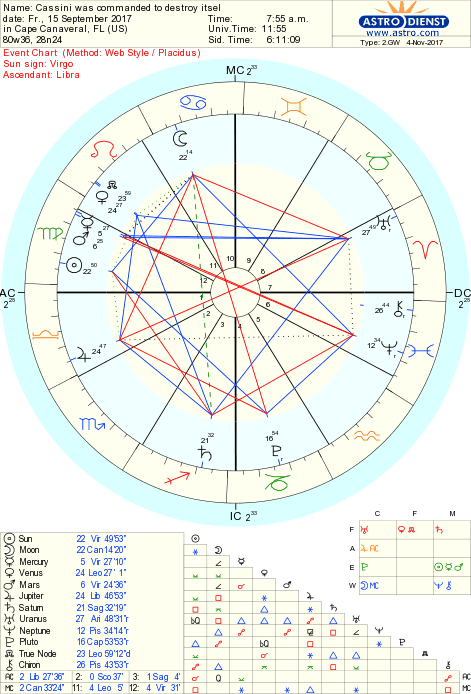 The chart of the Cassini entering the orbit of Saturn is fascinating, instead of an opposition, Saturn is now conjunct Sun in Cancer; the Cassini (the Sun) attained Saturn at home (Cancer, sing of the Moon). And the Moon conjunct Pluto in Sagittarius is an image of mankind reaching the horizon, mankind opening a new dimension for its evolution. The third chart is spectacular; the Saturn in Sagittarius is now in square to the Sun in Virgo, sign of purity; the Saturn’s return in Sagittarius shows the accomplishment of the mission, the long and painful path of the Cassini to hit the target. Sagittarius is wisdom, the knowledge received through faith and long pilgrimages; the square announces a new struggle, a tension between the mountains of new data and images and the year it will take to use (Virgo) this information. The Moon is its own sign; humanity is back home, we had to remember that we live on this Earth, and here we have to share and apply our knowledge. Pluto is now in Capricorn, the sign of Saturn, in opposition to the Moon showing that a planet, Earth, is threatened by greed, nuclear weapons, chemicals, and stupid politicians. This must be the message the Saturn sent us back. These three charts compose a sort of symphony of themes and variations. In the three of them, Saturn is in tight contact with the Sun, opposition, conjunction and square, the three movements of the symphony; the signs the Moon is in, Scorpio, Sagittarius and Cancer, are the melodies; Mars and Venus, the tones and the special harmony of this dark and strangely beautiful musical score of humanity. Among the many revelations and phenomena of Saturn, there are strange storms that happen every 30 years on the surface of the planet. And what is that perfect hexagon at the North Pole of Saturn that changes from blue to golden? All we can say is that in the Hermetic tradition the hexagon is the Solomon’s seal, the hermetic seal representing the cosmos.